This weekend, someone asked me how a band “nobody has ever heard of” that “doesn’t have a radio presence” could make such a huge debut as that of Flatland Cavalry. My simple reply…”the right people have heard of them.” This goes back to the whole chart and radio debate from a few months back. Word of mouth trumps all. Good music stands on its own merits and will often (not always) find its audience. Here’s to the Humble Folks and all those independent musicians traversing the Texas highways and biways doing it for themselves and proving folks wrong. The Cleto Cordero-fronted outfit has been bubbling on the buzz bubble of the Panhandle for some time. Last year they dropped an EP that turned some ears and set the table for the monster release that became Humble Folks. Their sound is reminiscent of Turnpike Troubadours both lyrically and musically. The fiddle is pronounced and bouncy. The lyrics real and emotive. The vocals achingly authentic. The main stylistic difference between TT and FC is the manner in which they unleash the lead guitar. Ryan Engleman’s Tele is ferocious and forthright. Reid Dilllon’s work is more subdued and a touch twangier. Both are fantastic and both fit the bands to which they belong. Much like early Evan Felker, Cordero sheds any youthful missteps via thoughtful lyrical turns of phrase that contrast his youth. These songs yearn and are fraught with heartache, loss, wisdom, merriment and joy. In a record with no filler spots that is a true album, lead single “February Snow” may just be the weakest of the bunch…which is saying a lot. “Goodbye Kiss” is going to be the one that most likely ends up getting the most attention a la American Aquarium’s “I Hope He Breaks Your Heart”. Two sides of the same coin. Replete with a properly used f-bomb. Nothing here is groundbreaking territory, it’s just that Cordero and company take a new approach to showing you the landscape. This album is easily the best that’s been released in 2016 for this scene and should be among the conversation of year’s best at year’s end. The early success will build a momentum that will be nearly unescapable. 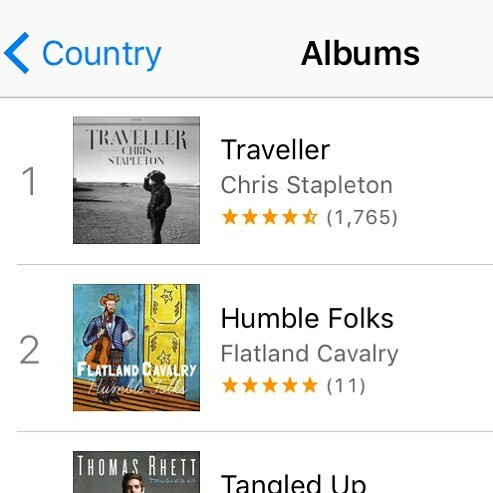 Buckle up, Flatland Cavalry y’all are the next in line to take a trip to the top of Texas/Red Dirt. It’s a whirlwind, but you’re gonna be just fine. Thanks for the review. I had never heard of these guys. Just bought the album and the EP. Good stuff. I just want to tell you that I am new to weblog and truly liked this web blog. Probably I’m want to bookmark your website . You really come with amazing articles. Kudos for revealing your webpage. whoah this weblog is excellent i like studying your articles. Keep up the great paintings! You already know, a lot of persons are searching around for this information, you can aid them greatly. Thank you for another magnificent post. The place else may anyone get that type of info in such an ideal method of writing? I’ve a presentation subsequent week, and I’m at the search for such information. I’m still learning from you, as I’m making my way to the top as well. I absolutely enjoy reading all that is written on your blog.Keep the posts coming. I loved it!